Disclosure: I received these products for free as part of a review . The opinions in my review are honest and my own. I will freely admit, I love spy movies. While I can’t pinpoint exactly when I started liking watching and reading stories in this genre, I will freely blame my brothers. They are all big James Bond fans and they loved sitting down with some popcorn and watching some of these movies. Now granted, I don’t know what it says about my family when they could have a James Bond and Godfather marathon, but hey, it works! Since I haven’t read one of these books in quite some time, I was asked to review the latest book in the Craig Page trilogy. Having never read the books, I was a bit nervous, but was ready to jump into the challenge and see if this could be a fun stand alone book! Russian Endgame revolves around a former KGB agent orchestrating an alliance between Russia and China, with the role of them working together to not only kill the president of the United States, but steal secret military weaponry. Like most spy books, the hero, Craig Page, is sent to stop his old enemy and get these dangerous weapons out of enemy hands. Can he save the United States or will the western world be changed forever? Personally, I thought the book was very well written and it does keep your attention. While I had a hard time suspending my disbelief at times, the actual writing in Russian Endgame was very well thought out. The character also seemed very interesting, even if the dialog in some areas felt a bit..choppy? Since I couldn’t put the book down, I don’t think this was too much of a deterrent and I still enjoyed most of this spy thriller! I’ll admit, the theme seemed a bit farfetched to me and I had some issues connecting to the characters. It wasn’t that it was a bad book, it just had some areas where I had issues keeping up with the story. I think most of the issues I had, however, were due to the fact I was reviewing the last book in a trilogy. I personally wish I could have found the first two books in my local library before starting the review. If you are a fan of the series, however, you will probably enjoy most of the action in this spy thriller. Since the book has a good premise and a good development, I am happy to give Russian Endgame a B- rating. Want to check out the third book of the Craig Page Thriller? 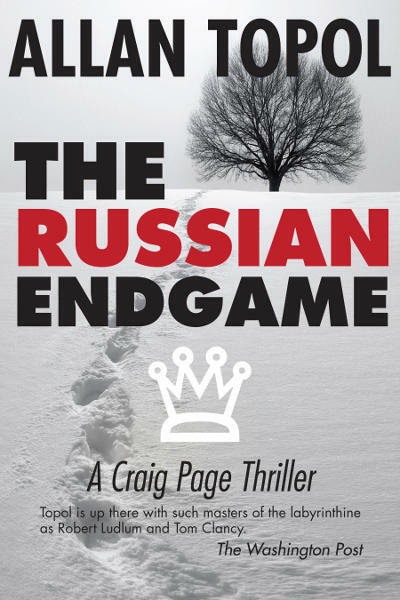 You can purchase the Russian Endgame at most big box retailers and on Amazon.com – where this book is currently selling for $12.88 for the paperback or $8.99 for the digital Kindle edition of this book. Disclosure: Budget Earth did not compensation for this review but did receive a copy of the book for review purposes. All opinions on this product are my own and may differ from our readers’ opinions. I am a fan of thrillers and this book sounds like something I should enjoy reading. I appreciate the thoughtful review. My son is an avid reader, and this sounds like it's right up his alley. I'm glad you wrote about it. Thank you, and I'm going to bet my son will be thankful too.